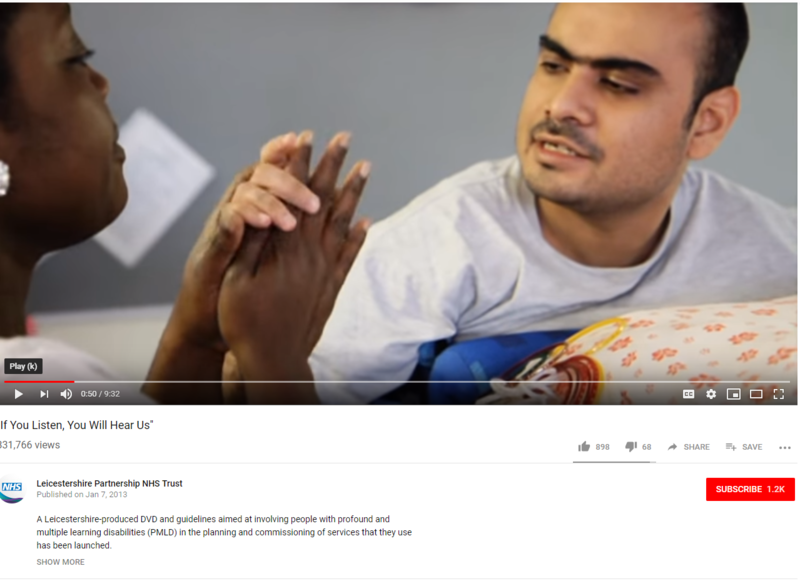 This video from Leicestershire Partnership NHS Trust was part of the ‘If You Listen, You Will Hear Us’ project which gives a voice to all people with profound and multiple learning disabilities (PMLD) and aims to involve people with PMLD in the planning and commissioning of services.. It was produced by the Leicester and Leicestershire Learning Disability Partnership Boards along with frontline staff, carers and people with learning disabilities themselves. The Partnership Boards are made up of representatives from the local NHS, local councils, self advocates and carers. The inspiring and moving 10 minute video features footage and interviews with people with PMLD, staff and carers. It tells the story of how people with PMLD interact with staff, and how staff use their expertise to best communicate. The guidelines cover the need to value all ways of communicating, the fact that everyone communicates, how a very personalised approach is needed for people with PMLD, how gaining views may take a long time and some educated guess work along the way, and that family carers know their relative the best and are the experts. It’s about building a long-term picture of what people PMLD like and dislike and what their wishes are.